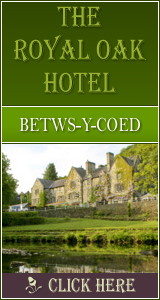 Tariff ~ From £42.50 per person per night. The Tyn-y-Coed Inn at Capel Curig, Betws-y-Coed amidst the beautiful mountains of Snowdonia has been developed into a very relaxed and friendly quality hotel with bedrooms tastefully furnished and each, naturally, has a bath or shower room, television, phone with data sockets, hairdryer and hot drinks tray. Most of our rooms have been renovated to a higher standard of furnishings - three of these have four poster beds. All have designer bath or shower rooms, two of which have sauna shower. We have three family rooms, and when children share a room with two adults charges are reduced as set out in our tariff. For guests on a more modest budget we have a room for 5 in bunks with private shower room. Other facilities include a drying room, cycle storage, launderette, patio and garden areas. We serve a wide range of ales, wines, food etc. and attract a mixed and cheerful clientele. Our menu largely consists of Welsh produce sourced from local specialist suppliers as acknowleged by Taste of Wales.Our menu is available throughout the bars and restaraunt areas. The Inn is fully licensed and three of the bar rooms have open fires.The old Quarrymans bar at the rear has a pool table. All our front rooms , public and bedrooms, look out on Moel Siabod, nothing to look at except beautiful scenery, the mountains-and sheep! no matter what time of year. Across the road the River Llugwy flows past the meadow belonging to the hotel, the stretch includes a deep pool perfect for swimming and many shallow parts where our younger guests enjoy fishing, paddling or skimming stones. 1892 Click Throughs => �946 Since 13/May/2013 based on an example �0.50 cost of a click through from Google pay per click.